The Twickenham Rifle & Pistol Club are a small, friendly and family orientated sports club, founded in 1903 and an active member of the local Richmond Upon Thames and Twickenham community. They are always looking for new members and are equally happy to welcome absolute novices as we are Olympic triallists, indeed they have a particularly high number of families who join the club, and shoot together for fun on a Sunday afternoon. Target shooting requires concentration and co-ordination rather than physical strength and athleticism and so is equally suitable for men, women, young and old, able bodied and disabled to participate and compete together. This is an inclusive activity and the disciplines they follow at Twickenham RPC are respected internationally and have been an integral part of the modern Olympic Games since their inception in 1894. Twickenham is one of the oldest and most respected shooting clubs of its kind in the United Kingdom and members have been very successful over the years. They continue to enter multiple teams for competition in both the Middlesex and Surrey County Leagues and whilst joining a league is not obligatory we do encourage members to enter as there is no better way to measure your improvement than by shooting under competitive conditions! 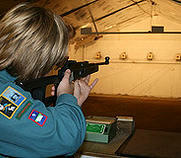 Twickenham Rifle & Pistol Club is easily accessible via SW Trains (Twickenham), bus and car (off the A316).